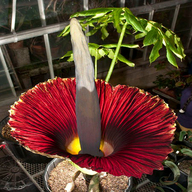 Currently, there are no Titan Arums blooming in the Botany Greenhouse located on the campus of Western Illinois University. The Inflorescence of WIU Titan #3 did not open. It collapsed during the evening of May 24, 2012. Blog has picture updates, daily growth change and more.